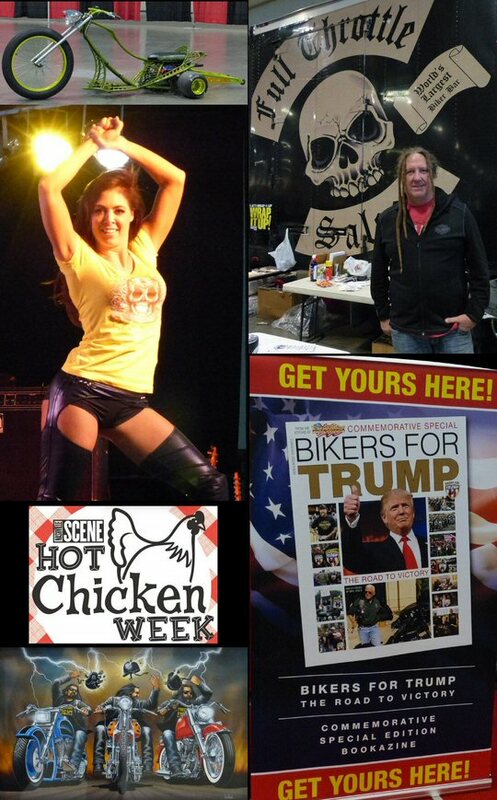 It just so happened that Hot Chicken Week (January 23-29, 2017) coincided with a hot week of bikes in Nashville, Tennessee. 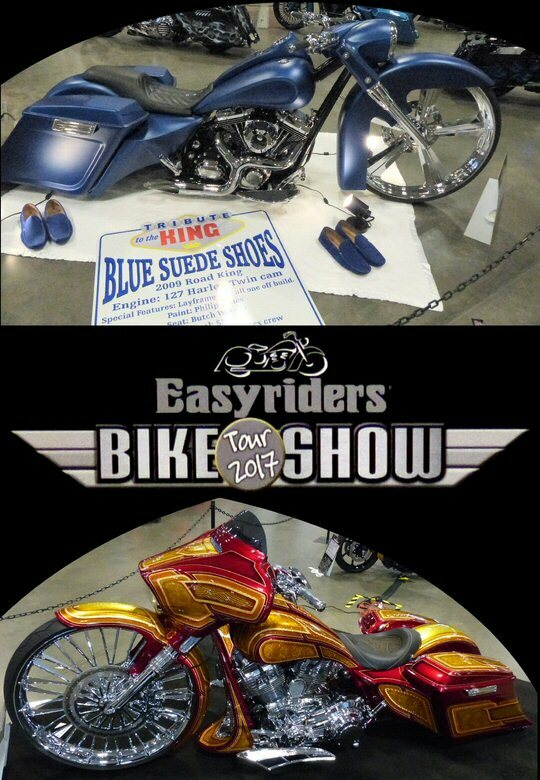 Easy Riders Bike Shows, one of which was rolled into Nashville’s Music City Center on January 28, 2017, are called the Hottest Custom Motorcycle Shows in America. Presented by Easy Riders Magazine the events are all about motorcycles. Easy Riders Magazine is the biker’s bible of the two-wheeled lifestyle. For over 40 years the publication has promoted motorcycle culture and created an interest in custom bikes worldwide. Many custom bikes were on display including a tribute to The King. Interestingly, AMSOIL Arenacross and Harley Davidson were also in town. Harley hosted a corporate event at the Music City Center January 25-27, finishing up one day before the Easy Riders 2017 Bike Show set up shop for Saturday. Easy Riders had a tractor trailer on site to promote the brand and related products. There was a large stage with seating as live music was part of the party as were demonstrations, door prizes and a fashion show presented by the Purrfect Angelz. Although the Angelz were showcasing special tee-shirts for sale folks might have been paying more attention to the ladies suggestive dancing. Food and drinks were available and there were tables/chairs scattered about the venue to kick back and talk shop. Plenty of visitors were clad in black, leather or wearing their bike club’s emblems. Lots of vendors were on hand selling accessories, clothes, parts along with other tools of the trade. There were even a number of lawyers on site. Faith based biker organizations were well represented at the Easy Riders 2017 Bike Show in Nashville offering hope. The spirit of bike culture came alive though the original artwork of David Mann. Michael Ballard of Full Throttle Saloon was seen circling the venue in route to his sizeable set-up at Music City Center. Boswell’s – a local Harley Davidson dealer – also made their presence known. There is a reason Easy Riders Bike Shows are called the Hottest Custom Motorcycle Shows in America and it’s the incredible two-wheelers on display. Many brands from the past into the present were represented. We saw vintage Hondas, Indians, a few Triumphs and loads of Harley Davidson motorcycles with the custom bikes being the big draw of the event. The Purrfect Angelz put on an engine revving fashion show for Music City. Forgive us Father as we were drawn to the sizzling bikes by Sin Worx. The dark Ravn featured a detailed and dramatic paint job in contrast to Blue Suede Shoes that enticed us with its cool plain blue attire with lighting built into the body of the bike. Sacred Steel Bikes had us exclaiming holy cow as did so many of the masterpiece motorcycles with shiny, spotless components. Bikes with intense, intricate paint and parts dominated this show. Corporations were also in on the action. Jack Daniels Lucky #7 featured a colored speckled paint job and John Deere’s two-wheeler was sporting the signature green/yellow color scheme. The biker’s bible Easyriders hosts the hottest events in the States and in Nashville they continued to proclaim the gospel of motorcycle culture, a passion for the road and the cult of custom bikes. So from hot bikes to fried hot chicken which is a local specialty of Nashville. In its typical preparation chicken parts are marinated in a water-based blend of seasoning, floured, fried, and finally sauced using a paste that has been spiked with cayenne pepper and its usually served as a sandwich with pickles. It is generally accepted that the founder of hot chicken is the family of Andre Prince Jeffries, owner of Prince’s Hot Chicken Shack. Andre has operated the restaurant since 1980; before that time, it was owned by her great-uncle, Thornton Prince III. Jeffries states the creation of hot chicken was an accident. Her great-uncle Thornton was a womanizer, and after a particularly late night out his girlfriend at the time cooked him a fried chicken breakfast with extra pepper as revenge. Instead, Thornton decided he liked it so much that, by the mid-1930s, he and his brothers had created their own recipe and opened the BBQ Chicken Shack café. Many restaurants participated in the Nashville Scenes “Hot Chicken Week” and we partook by tasting the fiery five dollar sandwiches offered by Puckett’s Grocery and Restaurant and the Hard Rock Café. 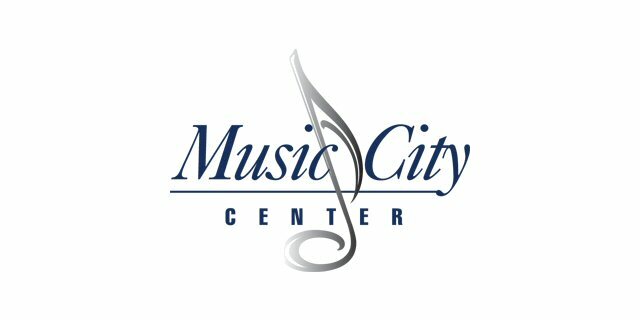 The Music City Center located at 201 5th Avenue South is the hub of Nashville, Tennessee. Opened in 2013, this 2.1 million square foot facility is in walking distance of attractions, hotels and Music City’s world famous honky-tonks. The modern convention center is equipped to handle a varied and vibrant list of events such as the Easy Riders 2017 Bike Show. Please check their website for more information. Scenes from the Easyriders Bike Show in Nashville.